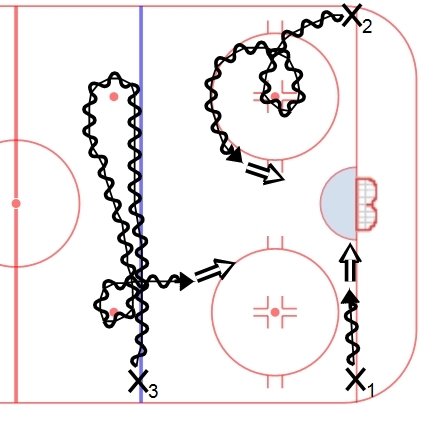 A simple half ice shooting drill that is good for goalies and for shooters. Players are at all three spots with pucks. All three go on the whistle. X1 attacks along the goal line and tries to shoot or stuff short side. x2 skates to the dot, escapes and then attacks hard through the seam along the circle. X3 skates along the blue line, does an acceleration turn around the far dot, a tight turn around the near dot and then takes a long shot from the top of the circles. Players then switch lines after shooting. Each player has a slightly different shooting situation that they are simulating and should play it accordingly. X1 needs to attack the net, protecting the puck towards the goal line. X2 needs to accelerate hard through the seam, shooting with their feet moving. X3 needs to work on attacking wide and getting a shot of in-stride and on the lead foot. Goalies see three different game situations – a goal line stuff, a seam attack and a long shot from the wide angle. Each needs to be played slightly differently – a VH or lean/reverse VH on the goal line attack, a quick recovery and strong play on the seam attack – upright and on angle, and then a depth adjustment on the wide attack. Do you do all your drills in Drilldraw. If yes, would you be willing to export them to us. Saves us entering them each time. p.s. you have great drills. I’ve figured out how to export them. I’m working on the best way to get them to you as unfortunately I can’t seem to attach them to the blog. I’ll post something when I get it figured out.